What is the definition of Video Contribution? Is it the same as live streaming? Live Streaming is a generic term and can apply to any part of the process from capture on the camera where video is immediately streamed, to the process of playout on any device. Playout is a huge subject in itself. However "video contribution" is considered the terminology used to capture at the camera end, and to deliver live video from the camera to where ever it needs to go. Normally in an outside sports environment this maybe to use RF links to an Outside Broadcast Truck, or in a live news environment the feed may go back to the studio via a satellite dish on a SNG van. What about using LTE links to do outside video contribution instead of satellite or RF links? The 3G and 4G network is very capable of streaming live video, especially if good compression is utilised. The issue of course is reliability. Telco providers vary in coverage and signal strength, so picking a single provider for the whole of a cycle race for example, may prove unreliable. What can be done is to "bond" multiple providers together to form a single connection. If one of the providers loses signal strength, then the others can automatically compensate, assuming the right bonding technology is utilised that can act in real-time. What does Soliton do in outside Live Contribution? Soliton Systems is technology company that manufacturers mobile encoders and decoders for video contribution. Used by many sports companies, news gathering and other live event production companies, their Smart Telecaster range of products will encode to H.265 (HEVC) and rather than using satellite or line of sight antennas with RF, it can simply use multiple 3G/4G mobile phone providers to live stream over the internet. It is cheaper and has less latency than satellite. It can deliver live video to any decoding server with a global IP address, typically back at broadcast centre or command centre. Also given the Zao is a lightweight and rugged mobile device, the Zao can be placed on motorbikes, bicycles, cars, vans, helicopters and drones to stream live video to anywhere in the world. Will this make satellite and OB Trucks obsolete? It will certainly eat into that market. But the issue is to guarantee a Quality of Service to be provided by the mobile phone network. As mentioned, signal strengths go up and down and coverage is not always guaranteed. Also within a stadium environment, if 80000 people are accessing Facebook then again bandwidth availability may be limited. However one advantage of Soliton over their competition, is their H.265 over traditional H.264 offerings. At the Olympic opening ceremony, the Zao was still delivering video. When 5G comes of age, then video contribution across the mobile phone network will become much more the norm. Why is special about H.265? With the use of mobile phone networks and utilising SIM cards to stream video across the 3G and 4G LTE networks, video compression is critical. Traditional live streaming video solutions utilise H264 encoding to compress video, but the Zao utilises a hardware based H.265 encoder, that gives up to 50% more compression without loss of quality. H.265 (also known as HEVC) combined with multiple bonded SIM cards, is a winning solution. It provides much more reliability as it only need half the bandwidth and will still deliver video with a just a few hundred kb/sec of availability. Typically each LTE network should provide multiple MB/sec of availability. The other benefit is latency - typically half a second which is a positive effect of H.265 - ideal when giving news interviews without the embarrassing delay. The cloud is the present! But in terms of video contribution then there are some advantages given you can decode in the cloud and stream straight to a video delivery platform such as Wowza. But at some point you still need to edit, add commentary, tracks, titles, music etc. The two major drawbacks of cloud are security and latency. The Zao can use the cloud, or at least a browser interface so it can be managed from anywhere, including a support person who maybe at home on Saturday night and suddenly needs instant access from their sofa. The Zao has the option to encrypt and typically it will stream direct to a decoding server, normally in the customer's data centre. For the Zao to work, it needs a power source, and as a mobile device this can be standard camera v-lock battery. Dongles containing Sim cards are then attached to the Zao - it can support up to 6 but typically 3 is acceptable, preferably from different providers such as Vodaphone, T-Mobile, Orange etc. Then on the decoding receiving end, the Zao uses a decoding software solution called HD-View, that can run on a standard Win 7 or Win 10 platform, and this will be installed with a Blackmagic Decklink card to provide the HD-SDI output from the decoder. HD-View can also provide an RTMP (IP) video stream. A global facing IP address is needed for the server. 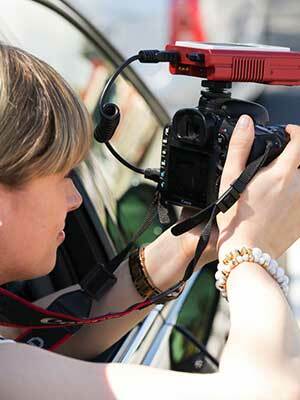 My camera-people are not technical savvy - is the Zao easy to use for them to use? I always think this is a cruel question - most camera people I know are pretty clued up on technology - but the Zao is very easy to use. It can be pre-configured; all the camera person needs to do is to hit the green button and it goes live. The green button is also available as a smart phone app should the Zao not be easily available, for example if it is in a backpack. The Smartphone app also can be used to control other elements of the Zao if required locally. But the Zao can also be remotely controlled, either via HD-View (the decoder) or via a browser interface with the correct sign on credentials.